Free Wi-Fi complimentary breakfast and rooms with microwaves and mini-fridges add to the allure for guests at the Rodeway Inn & Suites Augusta. The three-story hotel's 59 rooms offer complimentary Wi-Fi satellite TVs microwaves mini-fridges and coffeemakers. Non-smoking accommodations and rooms with jetted tubs are available. When morning hits guests enjoy free breakfast and complimentary newspapers. You'll also find free coffee in the lobby by the 24-hour front desk. Cap off the day with a dip in the seasonal outdoor pool. Parking is on the house. The Rodeway Inn is less than one mile from I-20. Fort Gordon is 12 miles away. 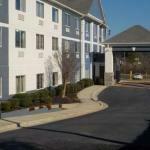 The hotel is about six miles from Paine College and about five miles from Augusta State University. It's less than two miles from Augusta National Golf Club which hosts the Masters Tournament. Augusta's historic downtown and landscaped Riverwalk which hugs the banks of the Savannah River are both 15 minutes away. Hartsfield-Jackson Atlanta International Airport is about 150 miles from the property.